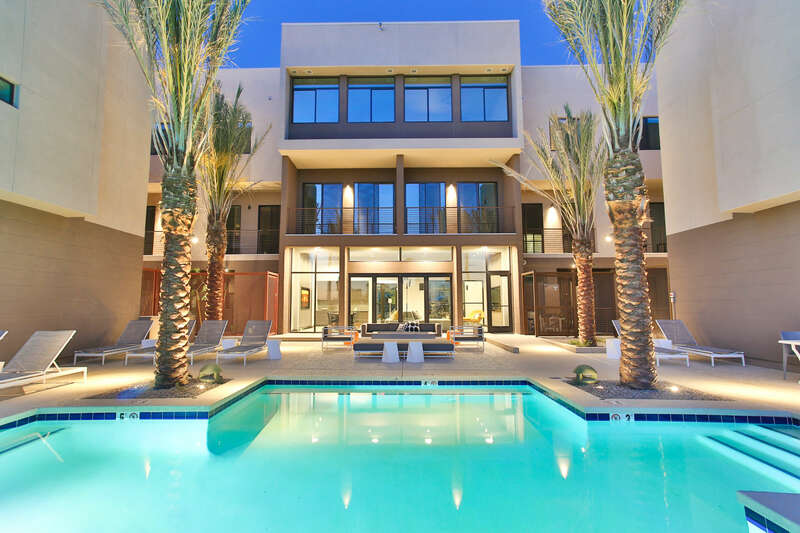 Developer Ed Gorman, head of MODUS Development in Phoenix, knew that nearby Scottsdale, perceived as a resort community, also offered a strong rental market. When a vacant, 1.8-acre parcel behind a church with golf-course frontage became available, he and locally based partner Viridis Group purchased it for $1.25 million in 2004. After the economy crashed, the partners waited and researched emerging technologies to make energy-conscious construction a guiding principle. They also envisioned constructing a small boutique building, rather than product similar to nearby luxury towers, that they could price at 30% less than new luxury units. By the time the economy recovered and the partners were ready to build, a thriving tech corridor had emerged in the metro. 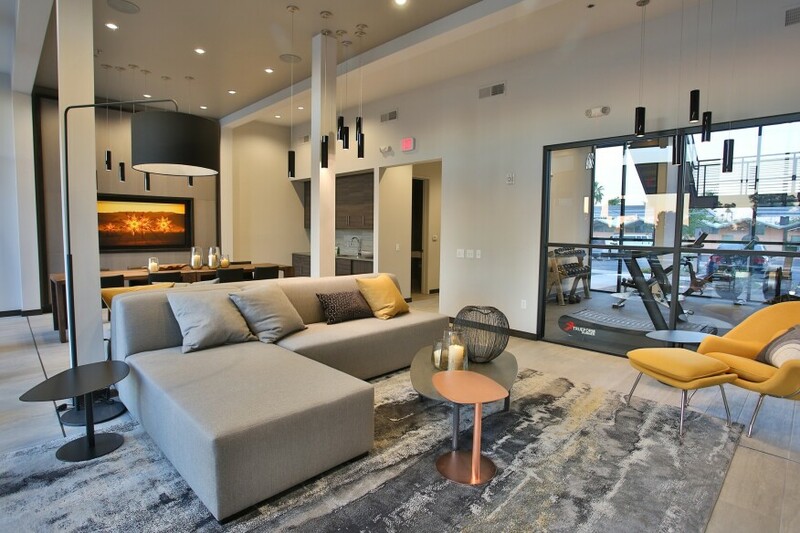 Young professionals were eager to live in the developers’ three-story building, which they had dubbed “Dusk.” Completed last summer, the building’s lease-up was a fast four months. Besides its intimate scale and “A-location,” the building’s net–zero energy technology gave it instant cachet. The choice of building systems and 1,100 roof-mounted solar panels on both the building and a parking structure produced enough energy on-site to compensate for all the energy used, yielding zero net energy bills at year’s end, says Gorman, whose earlier MZ Townhomes featured net-zero, LEED-certified condos. “We learned that buyers cared more about having lower utility bills than LEED certification,” he says. 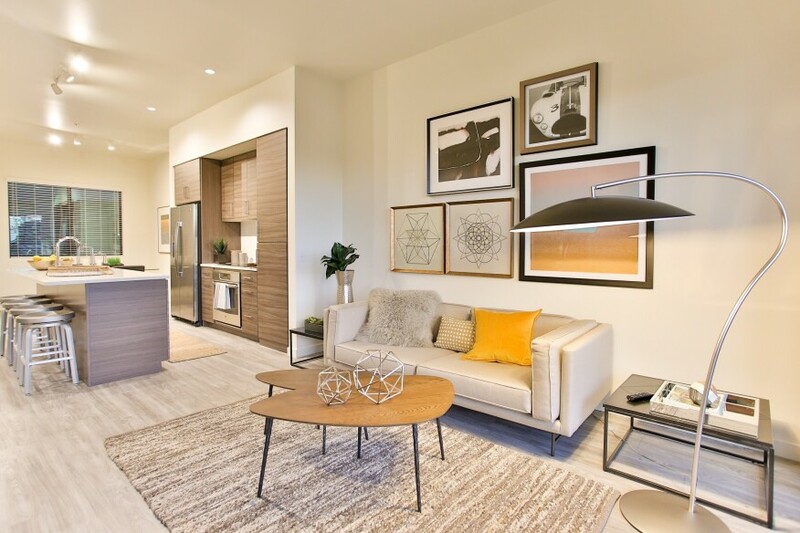 Contractor Greg Goss, a partner with Chris Jones at Ameris Multifamily Construction in Scottsdale, agrees: “Net–zero energy products translate to quantifiable savings in energy consumption,” he says. Gorman also credits the project’s success to working with the city of Scottsdale, Goss, subs, suppliers, and energy modelers who calculated the criteria needed. Gretchen Wakeman PhotographyDusk’s amenities had to be carefully selected to meet the project’s economics, since it’s a small boutique building with just 41 apartments. The developers decided a pool and spa were essential for the hot climate, along with a well-equipped fitness center. Dusk’s first-year results did even better than expected, with a surplus of energy credits and an annual energy savings of about $46,500. The developers achieved this figure by making smart choices at the front end. For example, they bought top spray-foam insulation to reduce the amount of heating and cooling needed, which led to $4,000 in savings per unit. They also spent on energy-efficient LED lights, a heat pump that warms and cools the pool, and timers and moisture sensors for watering the drought-tolerant landscaping. High-performance glass for large window panes that reach up 10 feet high blocks strong sun but not greenbelt and golf-course views. The solar panels atop the flat roof are thought to make the structure the first net–zero energy apartment building in Arizona, and maybe in the country, Gorman says. The developers knew they needed a full complement of amenities to attract residents, since most millennials look online for what’s included even before they view a property in person, Gorman says. But he also knew the economics of the small building wouldn’t permit everything larger counterparts do. The team chose to go with a pool, spa, barbecue, fire pit, grass amphitheater with seating, and lush plantings, all of which contribute to the desired resort feel. Indoors, there’s a lounge with wet bar that opens to the outdoors and a fitness room. Both are especially appreciated when temperatures climb past 100 degrees F. Sherry Engle of S.E. Design in Phoenix did the interior design. Gretchen Wakeman PhotographyThe majority (85%) of Dusk’s units are two-bedrooms and feature open plans with condo-quality kitchen appliances and building materials. Graining on the cabinetry runs horizontally rather than vertically, a higher-end look. Other top picks: big islands, double-door refrigerators, and a cooktop and wall oven. Dusk’s kitchens were designed to connote high-end living, with large islands, quartz countertops, cabinets faced in a horizontal rather than vertical grain in a hip gray–brown hue, vinyl plank flooring with a concrete layer underneath for stiffness and noise absorption, and patios or balconies. The majority of units are two-bedrooms; the rest, one-bedrooms. Square footage ranges from 550 to 1,212 square feet, with rents from $1,185 to $2,000 per month. The exterior of the building was sheathed in synthetic stucco, which works well with the rigid foam insulation used on the walls and roof to create a tight envelope, says architect Lance D. Baker, AIA, president of Synectic Design in Tempe, Ariz. Although the building isn’t a TOD, area buses are available for transport to the nearby light-rail system. Additionally, the freeway is half a mile away. Gorman hopes the project will be a catalyst for other developers to build net–zero energy projects.